“The Witching Hour” is a beautifully shot episode of Salem. It’s absolutely stunning on a visual level at times, and when you really think about just what it possibly means for the Devil himself to be on Earth, the episode finds a way to truly depict that without going over-the-top with rain of blood and black skies. The opening establishing shot of the episode is an introduction to a new day, deceptively beautiful, and the few scenes with all of the witches together are terrifically framed as they all watch their Dark Lord with fear and reverence (but mostly fear). And the “Hush Little Baby” end montage to the episode and season nails the tone perfectly. 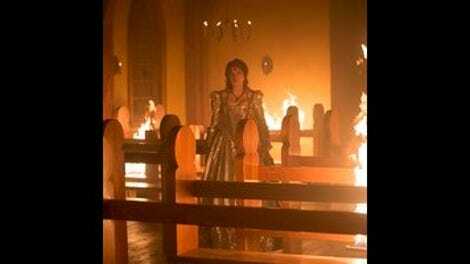 The pinnacle, of course, is the church fight scene, which is absolutely tremendous in terms of fight choreography and the sheer horror of the flames engulfing the church (and Mary and the Countess); it’s especially poignant as it’s all topped off with the heartbreak of Mary’s pleas to die as water washes over all of it. This an episode from the co-creators, written by Adam Simon and directed by Brannon Braga, and if there are two people who know what the show should look like, it’s them. However, as an end to the witch war (or at least this season), “The Witching Hour” still leaves quite a bit to be desired. While the finale does somewhat well to build intrigue for what will happen in the show’s hopeful third season, the conclusion to this chapter of Salem doesn’t completely live up to the potential shown earlier in the season. Part of the beauty of this season is in its ability to make the audience wish it would never end, but now that it has, there’s still so much about it that feels undone. That’s not in a cliffhanger way—it feels rather incomplete. All of Salem has been building to the rising of the witches’ Dark Lord, and with “Midnight Never Come” last week, it finally happened. John Jr. was a devil child before, but with the Devil 100 per cent in control this time, he’s even more terrifying. In theory, it should be the witches’ happy ending, but given everything we’ve seen from this season, it’s not even close to that. “John Jr.” (wearing all white, of course) doles out punishments to all those he believes have wronged his mother (Mary, who wants nothing to do with him), and that doesn’t even yet extend to the people of Salem. In fact, despite the fact that Mary was originally motivated by a need to punish Salem, that doesn’t even come into play in this episode. It’s a very insular episode, and while that’s good for closer examination of the more important characters, it also calls great attention to some of the inconsistencies—or just downright illogical behavior—among them as well. Mostly, the season finale could be considered Anne’s coming out party, as this is the episode where she confesses everything to Cotton, from her witchery to the love spell to the fact that she is the Countess’ daughter. It’s a lot of things to unpack, and she does so with a surprising maturity and rationality; she really just pulls the band-aid off here. Season one, Anne Hale felt very much like a child, especially in comparison to a quasi-love interest like John Alden or when she had to go head-to-head with Mary Sibley. This season has had Anne fall into those same traps on occasion, but there’s no denying she’s grown so much since the season one finale. Despite her innocence—at least in comparison to the other witches—Anne is still a strong witch and now one from a powerful bloodline. Yet she allows a fear to prevent her from living in happiness with Cotton or at least to do anything worth calling herself a hero. On the one hand, the episode having Anne decide to keep Cotton “safe” by ramming Brown Jenkins down his throat continues the parallels between Anne and Mary. However, while no one is singing the praises of George Sibley, Cotton Mather is a good person (so maybe she should have married Hathorne, after all) and Anne’s behavior—no matter what her excuse—is needlessly cruel. And for what? She claims to want to do some good for Salem, but at the same time, all we’ve seen her do is protect herself or Cotton; this is honestly the first time her hometown has come into such an argument. She clearly wants to embrace the witch part of her—which is fine, though Cotton makes an excellent point that the witches’ magic does come from the Devil—but she also claims to fear the Countess killing Cotton. However, if she would just take a moment and not behave as rashly as she does, she’d soon learn that the Countess is now no longer even a threat. In fact, Anne’s ignorance to the goings-on of the witches in Salem is only a hindrance to the “help” she wants to do. There’s still the Devil (who she was instrumental in raising), but on the ally front, by the end of the episode, the only ally he might even have is Sebastian. After all this build-up, the Devil stands alone—with none of the people who wished to see him even part of his world—and Anne proves herself to be every bit the monster she’s claimed Mary and other others to be. She’s may be even worse than Mary at this point. When she tells Mary (who it must be said, is far and away the best part of the episode) that “there is no easy way out” for any of them, the fact of the matter is that there kind of is (and often has been) for Anne. I’ve mentioned before that Anne can sometimes come across as being the quirky lead in a romantic comedy while every thing else around her descends into absolute chaos, and while she’s certainly part of the chaos in the finale (and has been for the past few episodes), her issues right now can all kind of boil down to a boy. And that’s not in the way that Mary’s issues are about her now dead son: Anne betrayed Mary, John, and Cotton to save Cotton’s life, and now she’s torturing Cotton under the pretense of again saving his life. It’s especially maddening in a show that preaches so much about the strength of women in a world where men are considered the strong one. That’s even another thing Anne brings up (to Cotton), yet it’s all more excuses for her weak, naive choices in this episode. But it’s better to be naive than just plain delusional, so in that sense, Anne is in a better place than Mercy by the end of this episode. In fact, maybe Anne’s behavior is just a case of like mother, like daughter: Only in the Countess’ case, her naivete ends up getting her killed. Oh, the Countess. She has spent the season being absolutely brilliant, only really suffering in strategy when it came to Sebastian’s obsessive love for Mary. So for someone who apparently knew everything and more about the Grand Rite, the very fact that she wouldn’t have foreseen that Mary’s existence as John Jr.’s mother would have an impact once the Devil took over his body is rather absurd. Then there’s her decision to go with the worst, most Maggie Walsh plan ever of having Sebastian kill Mary, under the very wrong assumption that “John Jr.” wouldn’t immediately know she would do that (or that the obviously frustrated Sebastian would really follow through with it). Other main characters in this episode come out of this episode unscathed (as characters, not physically or mentally), but the only one who even has as much focus as Anne and the Countess while coming away untouched as a character is Mary. Cotton is cast aside until the moments when Anne’s crisis of faith comes up, Tituba is immediately sent away to her Hitchcockian death, John is dying the whole episode, Isaac shows up to save a kid from Mercy (who reminds us that she still has male slaves all over town… and they somehow don’t factor into the witch war), and Mercy is Mercy. Plus, two seasons of the show telling us that the Devil would take down Salem, only for the Devil to not even take a moment to try to take down Salem, feels like a letdown. It’s all so frustrating, because it makes a disappointing end to an overall great season. It all just fizzles out. That’s not what Salem season two has been about, and yet that’s how it ends. Pretty interesting for a show with a flair for the dramatic. I’m not sure about a third season of Salem or even more coverage hear at TV Club for the show, but I have absolutely loved covering it this season. There hasn’t been the most conversation in the comments, but it’s always been interesting. Countess: “A monster is but a god seen through fearful eyes. Wisdom comes with acceptance, my dear.” First of all, I’ll miss the Countess’ way of seeing things the most. And also Lucy Lawless. Second of all, funny how it’s that lack of acceptance of Mary that leads to the Countess’ very unwise decisions. 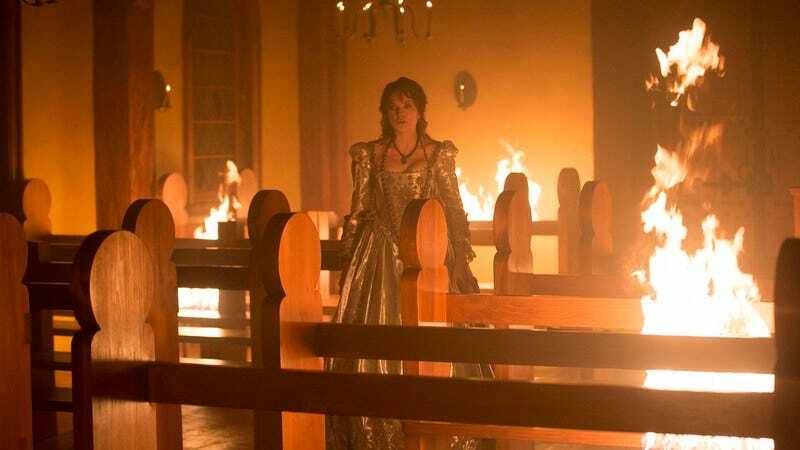 Mary (to Anne): “The world is a much darker place now that your light has grown as dim as the rest of ours.” A Salem season finale means the TV world is going to be lacking in Mary Sibley’s truth bombs once more. How will we survive? Isaac has a heroic scene, but after being given a new name last week, he doesn’t do all too much in this episode. Cotton really takes every thing like a champ in this episode. Too bad it doesn’t matter. The two most selfless people in the episode are Sebastian and Mary. I think that’s enough to say they could eventually make a pretty good couple. Actually, I still don’t consider that too redemptive for Sebastian as a character—I still miss Wainwright. So the death count in this episode is Tituba, the Countess, and Mary. Obviously (obviously?) Mary will find a way to come back to life, but if Tituba is truly dead, that eliminates what is quite possibly the show’s most interesting regular relationship. As much as I love the Countess, I never expected her to live past the season. Hathorne escapes this season alive. Boo this man.